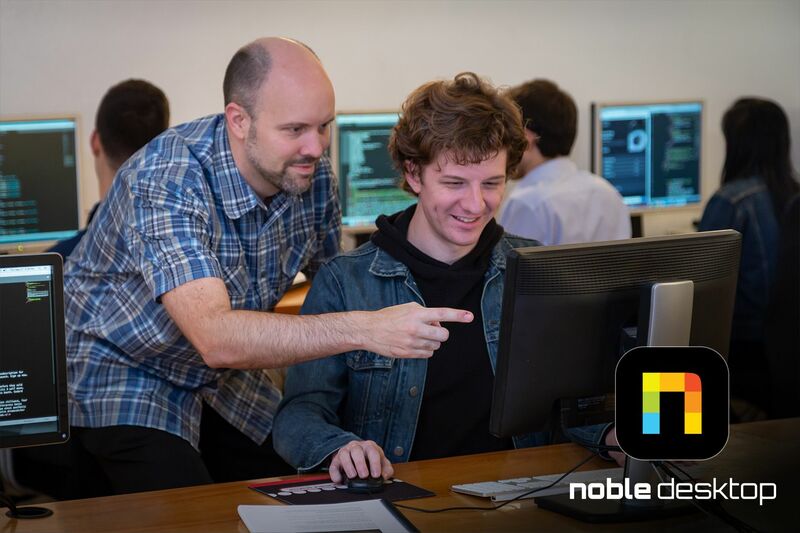 Noble Desktop provides skills-based coding and design courses in New York City. Students can enroll in day courses, weekend workshops, and intensive part and full-time bootcamps without taking out a loan or quitting their day job. Noble Desktop’s modular class format helps students learn precisely what they need to fill in skills gaps, increase their value at work, or start a new career. Noble Desktop offers several NY-state licensed certificate programs in web design, web development, or UX/UI design available in NYC or online. For beginners that want to try coding, Noble Desktop offers free in-person seminars that walk you through skills-based coding exercises. Are you a UX/UI designer that wants to transform your mockups into a working website? Or a back-end developer that wants to learn front-end? Noble Desktop's courses can be combined to fill gaps in your coding abilities or fulfill requirements for a certificate program. iOS App Development. In the iOS App Development bootcamp, students develop apps in Xcode using Swift, creating several applications and their own project throughout the course. UX/UI Design. In User Experience (UX) Design and User Interface (UI) Design, students learn design theory and how to apply those concepts to projects. User research, personas, wireframes, interactive prototypes, and more inform a user-centered design. Visual design builds on UX insights to form a beautiful end product. Class sizes are small and everyone receives one-on-one assistance with the instructor when they need help. In every class, students start coding and designing right away. Each course comes with step-by-step manuals developed by a team of experts and updated to reflect the trends in coding and design. Free retakes are available for every class. Since 1990, Noble Desktop has taught more than 40,000 students in their free seminars, classes, and certificate programs. Courses at Noble Desktop have over 2,300 reviews from entrepreneurs, developers, and managers around the globe. Noble Desktop alumni work at Fortune 500 companies including American Express, Condé Nast, Oracle, and NBC Universal. Many more alumni run successful coding and design studios.